Diamine Teal is an ink I've had for a while! Let's get a gander. 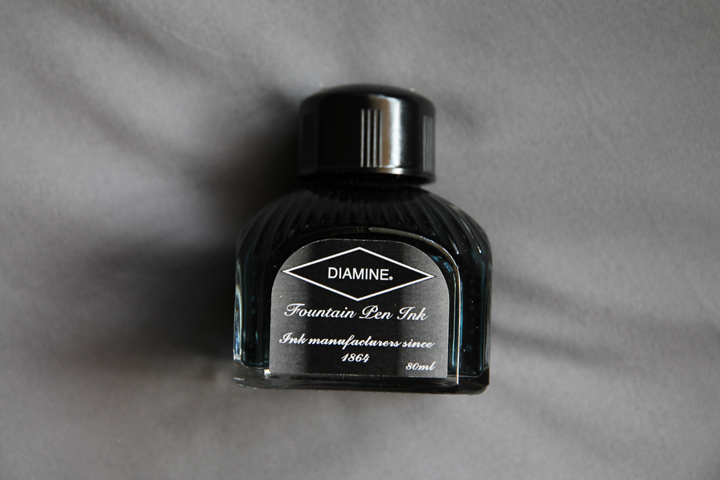 Diamine inks in the regular line come in two sizes: a glass 80ml bottle, and a plastic 30ml bottle. I quite like the amount of ink you get in these two sizes. I've owned inks in both of these sizes, and I think they fill a really necessary space in the ink-o-sphere. Sometimes you just don't need 80ml of ink, you know? Diamine inks are made in the UK, so they're usually cheaper across the pond than they are in the United States. Even so, they're some of the more inexpensive inks on the market, coming in just after Noodler's in terms of price per ml. Personally, I prefer Diamine over Noodler's nowadays. Teal is a dark blue green. It's not quite the color I think of when I think of teal—usually I imagine something a little lighter—but it's definitely in the right color family, I think. Diamine Teal takes quite a while to dry, likely somewhere in the 45 to 50 second range. It is a little water resistant, but if you're writing super important documents, I definitely wouldn't use this ink. There's barely anything left on the page, so you'll likely salvage a letter, but not your manuscript. The ink doesn't have any interesting properties to my eye: I don't see any sheen, and only a mild amount of shading. It's a very understated ink, which I rather like. 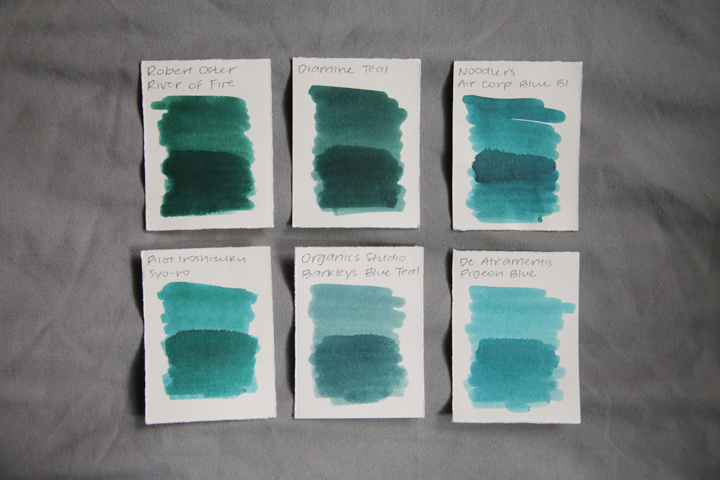 Diamine Teal is a little similar to Noodler's Air Corp Blue Black, but not enough for me to say that they're dupes. I've compared it here to other dark blues, but I don't currently own anything similar to it. 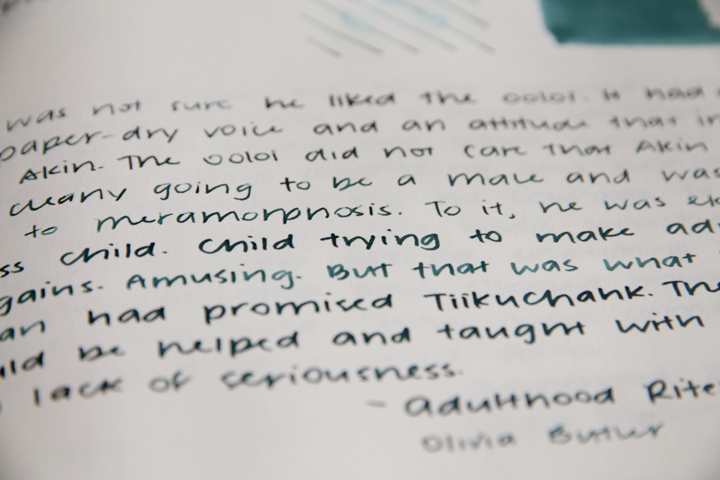 I love Diamine Teal a lot, and I'm pretty bummed I haven't been able to reach for it recently. It's a great color that you can use in numerous situations, dark enough for formal settings and still intriguing enough that they're great for things like letters and journal entries. 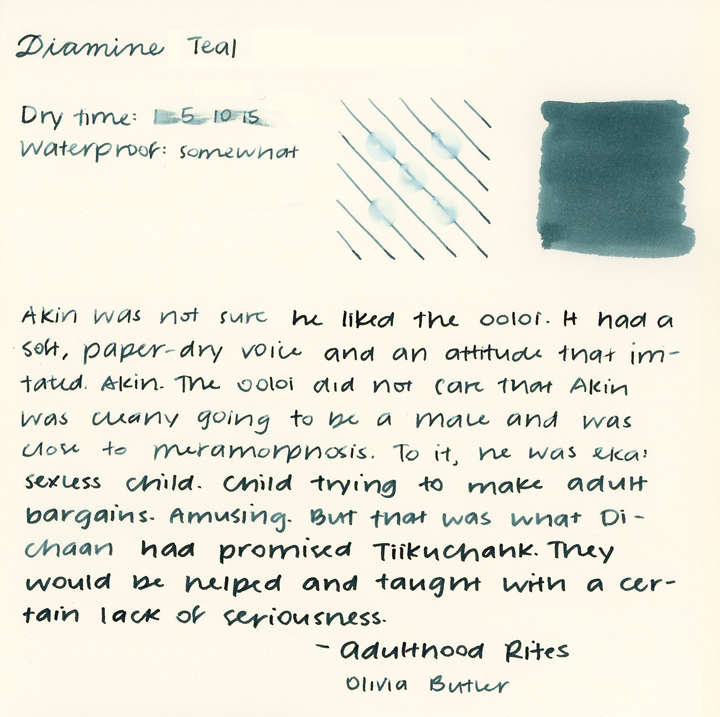 Diamine is one of the best ink brands out there, I think: they're really affordable and also perform well. I don't think I'll be able to buy another bottle of Teal for a long time, but I for sure have enjoyed it while I have it!